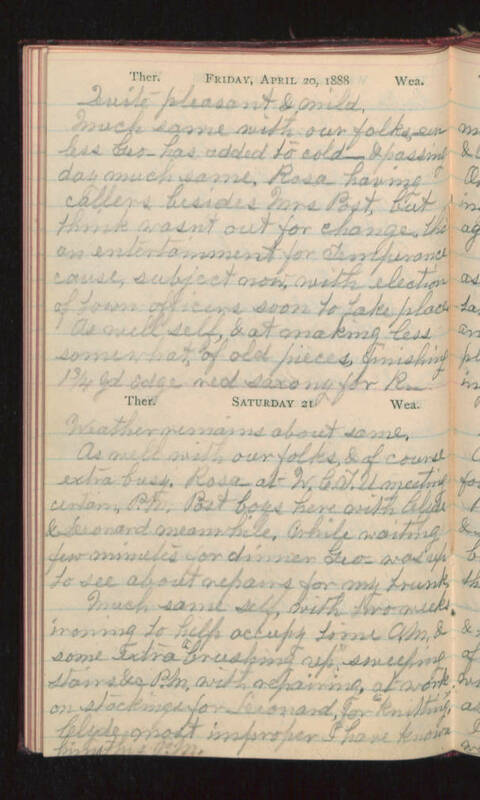 Friday, April 20, 1888 Quite pleasant & mild. Much same with our folks unless Geo- has added to cold- & passing day much same. Rosa having callers besides Mrs Post, but think wasn't out for change, tho' an entertainment for Temperance cause, subject now, with election of town officers soon to take place. As well self, & at making less somewhat, of old pieces, finishing 1 3/4 yd edge Saxony for R-. Saturday 21 Weather remains about same. As well with our folks, & of course extra busy. Rosa at W.C.T.U. meeting certain P.M. Post boys here with Clyde & Leonard meanwhile. While waiting few minutes for dinner Geo- was up to see about repairs for my trunk Much same self, with two weeks ironing to help occupy time A.M. & some extra "brushing up", sweeping stairs &c P.M. with repairing, at work on stockings for Leonard, for "knitting", Clyde most improper I have known him this P.M.